Sometimes we lose sight of the truly important things in our lives. Perhaps we become so absorbed in work, we forget to make time for family and friends. Or we fail to realize that what seems unimportant to us could be very important to someone we love. 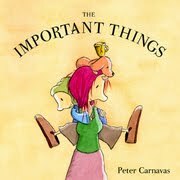 In The Important Things, written and illustrated by Peter Carnavas, and published by New Frontier (2010), "Christopher's mother had to do everything for his father had faded from their lives." We see Mum multi-skilling, frazzled, trying to hold things together, even finding time to play with Christopher and cook pancakes for him. But the illustrations show us there is a lack of communication between her and her son. They seem lost and adrift. One day Mum must decide it's time to move on, or does a friend advise her it's time to make a clean sweep and get on with her life? She fills a box with his father's old things, unimportant things like a cracked cup and tattered hat, and they take them to a secondhand store. One by one those things begin to re-appear in their home. Mum finally realizes that while she looked on the stuff as unimportant, perhaps things that caused her pain she was trying to forget, to Christopher they were all very important symbols of a father he wants to remember. This is the first book by Carnavas I've read. I'll be looking for more from this talented writer and illustrator. The fact he is both works very well in this children's picture book I believe, giving the book one strong vision, allowing him the chance to portray subtleties that contribute to our understanding. His illustrations are unusual, minimal, but with so much expression and clever use of colour/no-colour and other details that give us lots to think about. My favourite page is the last one. Christopher, clad in Dad's too big slippers and shabby hat, is playing the piano - an image that filled me with quiet joy for a little fellow remembering his daddy. The Important Things is an important book. It would be an excellent choice in a situation where children are grieving, perhaps because of death or divorce. It might open up possibilities for discussion and allow them to remember their own important things. I also see it as a book that reminds us all of the need to communicate with those we love. As parents, I believe we must remember that no matter how difficult a situation is, we need to talk to our kids about it, and listen to what they want to say. Wow. I think most of us can relate to this book! So many of us are living such lives of distraction that we really do forget to take time out to really listen to each other, and to notice the little things that really aren't so little. It just goes to show how one little picture book can really bring out the "big picture." This book sounds like it would be a great conversation starter, especially for children who may have trouble expressing feelings. Thank you so much for your wonderful review, Susan! You're right, Dawn. I love the way picture books do that, hone in on the essentials for living a rich and satisfying life. And yes, I think it would be perfect for starting conversations, especially with kids who have self-expression problems. I have just the child for this book. Thank you! That's great, Kelly - thanks for letting me know. My Kinder kids repeatedly asked me to read Munsch's "Love You Forever". I finally discovered it was because "we like to see you cry'! That's a tricky one, Green Mama. I wonder if you brought the book up in conversation, described it etc first and got feedback from her, would that work? That way she won't be reading non-existent messages into your gift. Grief can make us so vulnerable. I gave Love you forever to my mum two mothers days ago- that one's a killer!